In accordance with the City University of New York's tobacco-free policy, the use of all tobacco products is prohibited at Brooklyn College. In addition to cigarettes, cigars, pipes, and other traditional smoking paraphernalia, the policy prohibits the use of chewing tobacco and e-cigarettes as well as tobacco-related promotion and advertising. Smokers may continue to smoke outside of the campus gates but are asked to avoid smoking near campus entryways or windows, including those of the Student Center. The proper disposal of all smoking-related waste is also encouraged. sets a positive example for high school students and young children who are often on campus. 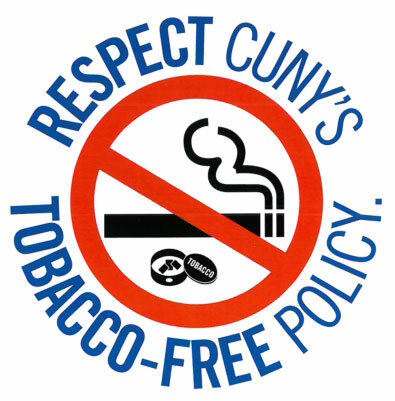 Please respect CUNY's tobacco-free policy. Thank you for your support. For further details about these and other programs offered by the college, contact the Health Clinic, 114 Roosevelt Hall, 718.951.5580.